Three Generals Walk into a Bar… | SPACE-BIFF! You’ve probably heard that old joke about what happens when Bernard Montgomery, Omar Bradley, and George Patton walk into a bar, spot a gorgeous woman at the back, and undertake a contest for her affections. No? Well, it goes something like this: Patton goes straight for her and starts bragging about the size of his detachment, Montgomery chats up the other ladies in the room in hopes of making the primary objective jealous, and Bradley sits around feeling inferior. Who gets the girl? Well, nobody does, at least not by Christmas 1944. Very few military rivalries have been so romanticized (or even so outright trumped-up) as the one between Patton and Montgomery, and sometimes Bradley gets slotted in there too. With the release of 1944: Race to the Rhine, you can finally live your dreams of proving once and for all that [insert chosen general] could have proven himself better than [insert rival] by crossing the Rhine and ending the war, if only you’d been there to lend your insight. Montgomery hugs the coast, bringing in supplies as he advances. Picture this: You’re Omar Bradley, and you’ve finally got your tanks fueled, guns loaded, and bellies fed. After the successful invasion of Normandy, the retreating Germans are finally mustering a defense along the Siegfried Line, and between their stout resistance and your dwindling supplies, you’re not sure you’ll ever cross the Rhine. On your left you’ve got Montgomery, and he’s doing a splendid job of taking coastal towns and ports; and on the right is Patton, barreling toward Reims with all the self-control of a bull in heat. You’ll have to plot your advance carefully, making use of your limited airborne and recon, let alone gas and bullets, and always taking care to protect your gains lest German remnants collapse any unsecured segment of your line. It talks like wargame, walks like a wargame, and chews tobaccy like a wargame, but it isn’t a wargame. Not exactly. First of all, for a wargame, it isn’t really about fighting. I mean, there’s still plenty of fighting, but we’ll come back to that in a moment. Second, it’s competitive — just not against the Germans. Sure, there are plenty of Germans in your way, and as time goes on there will be more and more. But they’re a feature of the landscape, as much an obstruction to your advance as the Norman bocage or the Rhine itself. Rather, your opposition are your allies, the generals Patton, Bradley, and Montgomery. Each is heavily invested in being the military genius that first crosses the Rhine and ends the war by Christmas, and they aren’t going to let a little thing like casualties or starvation get in the way of the glory. The re-colored cards are a sight to behold. The central concept behind 1944: Race to the Rhine is that you’re more of a quartermaster than a general, or perhaps some sort of ultimate-form general quartermaster, because you’re tasked equally with the details of a strategic-level campaign — advancing against mounting German resistance, taking risks in order to secure advantages, and making sure your lines are shored against intrusion — and also the duties of ensuring your armies are adequately stocked. This is a zoomed-out-real-far portrayal of war, where your supply trucks are every bit as crucial as the guys who do the shooting. Your army groups are effectively invincible, limited only by the resources you’ve supplied them with. Depending on what they carry, they surge through enemy lines or fall back in ignominious retreat, all because you didn’t give them enough ammunition to deal with their foes. If they become grounded, it’s because you didn’t dispatch enough fuel, or because their men are starving in the absence of any food rations, or just because you didn’t have enough trucks to get their supplies to them in time. It’s even possible that you failed to supply them because of a traffic jam, which in turn happened because you didn’t secure enough highways to the front. In a way, Race to the Rhine is a Euro-styled resource-mover, but instead of moving wood and portraits and whatever the hell else you move around in Euro-style resource-movers, you’re moving crucial supplies to your soldiers and then wagering your momentum on whether you’ve made the right decisions, assigned the right tools, and claimed the best resources from the shared and ever-dwindling stock. These wagers are always tense, especially since it can take a long time to get the right resources into the right places. You’ll need to requisition them, also requisition the trucks to ship them, and then drive them across hundreds of miles until they finally arrive at their proper destination. It behooves you to think as far in advance as you can: Do your men need more bullets on the offchance they’ll run into enemy infantry? Or more fuel in case of an armored division? All the large caches of food were claimed by Monty, again, so you’ll have to figure out how to get your troops fed before the next supply phase grinds all your momentum to a halt. But does that one battle-group need to be fed at all, or are you totally fine if they donate their gas to a more deserving army? And that’s just the supply side of your command. There’s even more going on here. Patton bum-rushes the Germans with wild abandon. If only you and your fellow generals would get along, you could cross the Rhine without any trouble at all. Instead, Race to the Rhine encourages you to go for each other’s throats at every possible opportunity. 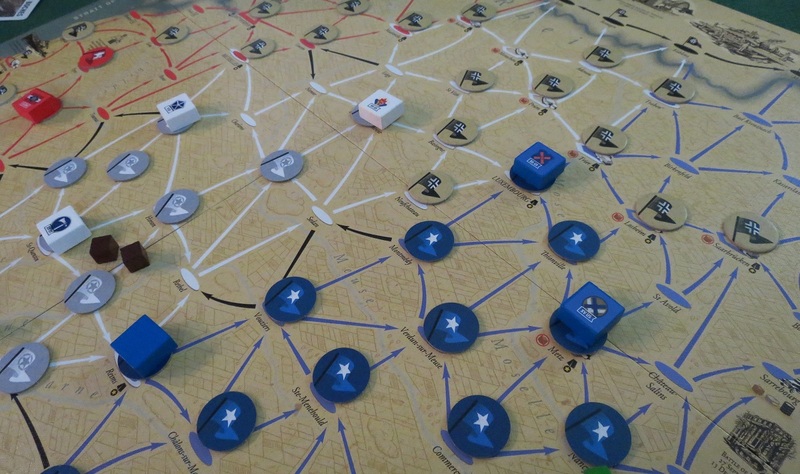 To act as an in-game timer and to keep the discussion lively (not to mention letting everyone drag down the winner), the end of each turn sees you either prompting the Germans to counterattack a weak point in an opponent’s line, or placing a token that denotes the growing enemy strength as you approach Düsseldorf. Moving onto these tokens forces you to draw from a much sterner encounter deck, so say goodbye to starving civilians, looted supply caches, and wimps like the 84th Infantry, and say hello to the army-mulching 3rd Panzer/Grenadier Division. Since this self-balancing tomfoolery makes it unlikely that anyone will win by actually crossing the Rhine before time runs out, it’s also possible to win by being awarded the most medals. You can pick these up through acts of self-sacrifice (say, by feeding those starving civilians with your precious food stores), bravery (by killing lots of powerful enemy armies), or through general douchery (by claiming contested towns for your own, thereby depriving your fellows of crucial highway junctures). That’s still not all. You can also spend precious actions to deploy air reconnaissance to take a peek at an upcoming deck, crucial for gauging whether or not to push on with an army that’s run out of ammunition. You can even spend some of your medals to drop the airborne into enemy territory. They’ll help out in combat, though of course they can’t hold out forever and it’s a huge investment to call them in at all. And in both cases, nothing is flying if the weather is bad. Which is to say, this is one of those rare games where traffic congestion and some bad weather can genuinely ruin your army’s chances of pushing through enemy lines. Bradley takes advantage of his superior logistical planning. There are a whole bunch of other things that make 1944: Race to the Rhine such a compelling experience. For instance, depending on which of the three generals you choose, Race to the Rhine plays differently. Patton is all about driving forward (of course), while Bradley tries to capitalize on his combined arms and initially superior logistics, and Montgomery tries to take all those coastal ports (including eventually Antwerp) to supply him mid-advance. They’re all still reliant on those tenuous supply lines to keep their engines, gun-barrels, and bellies warm, but their individual uses of their resources are often divergent. Like K-ration cervelat sausage mingling with malted milk tablets in lukewarm water, Race to the Rhine also hits that sweet-spot between complexity and simplicity, between a compact set of options for each turn and the far-ranging consequences of each action. When your armies stall, lose territory, and starve, there’s never any confusion about how you could have managed your situation a bit better; though at the same time, there’s very rarely a proscribed path forward. Sure, you’ll want to capitalize on certain cities and towns that can bring in more supplies, but are you better off encircling the area and taking it all at once, or creeping forward and carefully protecting your lines? There’s enough going on here that the decisions rarely come packed with a convenient answer. All in all, 1944: Race to the Rhine is a stupendous game, one of the best of the year. This time, Bradley, Montgomery, and Patton walked into a bar, and they all got lucky. Posted on June 9, 2014, in Board Game and tagged 1944: Race to the Rhine, Board Games, PHALANX. Bookmark the permalink. 9 Comments. Thanks for the review, this looks interesting! Excellent review, (other than the slights against Patton). This is an instabuy for me! And congrats on making such a great game! That was a fabulous review. I’m amazed you got your hands on this — it hasn’t reached general release last I checked. 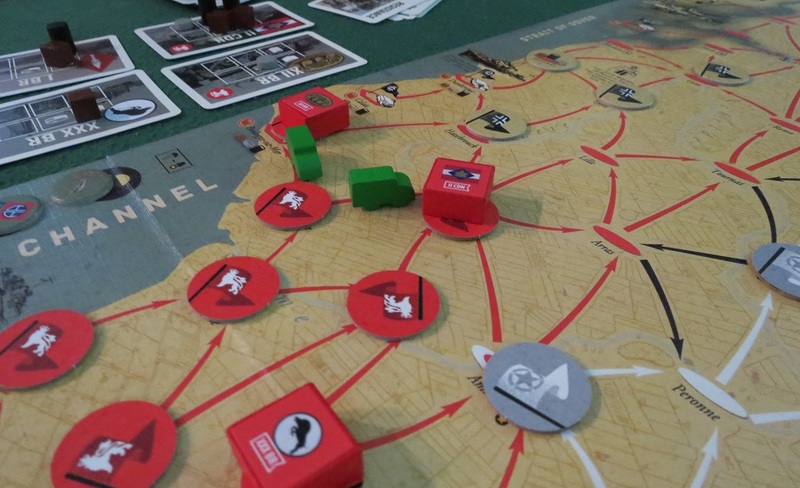 Pingback: I Survived Quartermaster General | SPACE-BIFF! Pingback: Best Week 2014, Day Four! | SPACE-BIFF!